Segment Start with Ruksar comes to Zara’s Room and She Puts Flowers in Flowers vases and She takes Out her Phone and She Takes Some Pics. Just Then Ruksar comes to Room and She is Surprised to See Ruksar in her Room She comes and Stands in front of her Asks what Are You Doing in My Room. 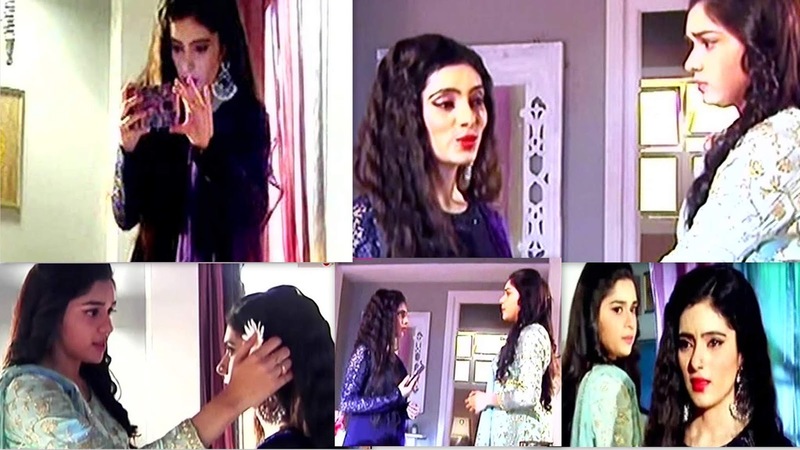 Ruksar tries to Hide her Phone But Zara takes her Phone and asks her why are you Clicking Pics of my room? Ruksar Hesitates and tells her that She is Going to Marry Soon that’s why She is Gathering Memories In Her Phone. Zara Knows Something is Fishy here She Goes and Takes white Flower and Places in Between her Hair and Ear and tells her that I am Giving You Flower so that You can go and Spread Smell in your Sasural. It's Like Warning to her to behave with your in-laws and with this Warning Scene End. On the Other Scene Kabir’s Father is Getting Angry on Kabir that he has Some Dreams for Him and Because of Any project he won’t Let Him do Waste Time. Kabir’s Father is Scolding Him because He is not Concentrating on Shariya Board Works. He tells Kabir If Anything come Between His work his father will be Biggest Enemy for His Project. Mirage is Listing all this and Smiling.